Tour to beautiful places of Nepal or nepal highlights is based on three pillar model in Tourism . This tour includes economy, ecology, and social issues. The program takes you to all the major tourist destinations of Nepal and helps the country and society in various way. The program is designed to provide direct involvement and income generating opportunity to locals with a fair price . It is environment-friendly tour and includes the involvement in society with cultural exchange. As per the economic perspective, we ensure contribution to locals, local small entrepreneurs, standard payment to staffs of service provider companies with minimal effect on clients budget. This program helps to create a win-win situation for client and local entrepreneurs and their staffs. Part of the profit made by the company also goes to society through CSR Activities. Similarly, we have an environment-friendly office, less paper use policy, recycle or proper disposal of garbage with minimal effect on the environment. Again, our tour is also designed to help ecology and support environment, encourage preservation of endangered animals & local plants. Hence tree plantation , nursery visit, elephant breeding center visit, Gharial breeding center visit, Cycling etc. are the part of the program. We need to travel responsibly. We care mostly about the social issue. We also involve the local people in Tourism and provide direct benefits to them. Therefore local homestay for a night give them direct benefit and development entrepreneurship, small Guesthouse stay helps local entrepreneur. And then visit to Thanka painting school, Visit Sanskrit school, meeting with Hindu scholars, Butter lamp pray at monastery, promoting Tharu cultural dance show by community, etc. will help clients to get involved in social activities. So, book your tour with EuroAsia to visit beautiful places of Nepal to enjoy the economic ,ecological and social issues together. Sanskrit School visit in Budhanilkantha. Visit to Mandala/Thanka painting school. Meet assist and transfer to Hotel, After check in Hotel and refreshed drive short to Typical Nepali restaurant for Dinner with cultural show as welcome dinner in Nepal. The four seeing eyes of Swoyambhunath Stupa watch over the valley from the top of 77-m high hillock on western side. This most glorious Stupa in the world is one of the holiest Buddhist sites in Nepal and its establishment is linked to the creation of Kathmandu valley out of a primordial lake. The surroundings of the Swoyambhunath are covered with small Chaityas & monasteries as well as some Hindu temples. Patan Durbar Square is an enchanting mélange of Palace buildings, artistic courtyards and graceful pagoda temples. Listed as a World Heritage Site, the former Royal Palace complex is the center of Patan’s religious and social life, and houses a museum containing an array of bronze statues and religious monuments. One remarkable monument here is 17th century temple dedicated to the Hindu god Krishna, built entirely of stone. Bouddhanath is a UNESCO World Heritage Site. The Stupa is on the ancient trade route from Tibet which enters the Kathmandu Valley by the village of Sankhu in the northeast corner. One of the oldest and the biggest Buddhist monuments ever built in Nepal, Bouddhanath is an imposing structure standing some 36 meters. The Stupa is said to entomb the remains of a Kasyapa sage venerable both to Buddhists and Hindus. The Stupa stands on the massive three level Mandala style platform surrounded by colorful private family houses. We will visit to Tibetan Thanka painting school within Bouddhanath premises. Group Pray with Butterlamp in the monastery will fascinate you with awesome experience with inner peace. Pasupatinath is considered one of the holiest shrines of all the Hindu temples. The temple has remained the presiding deity of ruling Nepalese Royalty. Located on the banks of the Bagmati river, this two tiered magnificent golden temple with four triple silver doorways is unique example of the Nepalese temple architecture. It is one of the largest Hindu temple complex in South Asia with hundreds of Shiva lingams, shrines icons of various Hindu god and goddess insides. The main entrance of this temple is in the western side facing a small street of Deopatan market. As non Hindus are not allowed to enter this temple courtyard. They are advised to go on the other side of the river in the East to have a glimpse of the temple complex. Historically pre-Christian era this temple seems to have its origin away back to the early Kirat period. Stone sculptures found in the vicinity support the antiquity of this place. Our guide will also take you to meet with Hindu scholar for interaction. Appx. 1 hour interaction with scholar will give you deep knowledge of Hinduism. Another major attraction within the valley is the medieval city of Bhaktapur (City of devotees), established in 9th century, with its unique outlook. Like in the other two cities here too, one can visit the old palace of Malla Kings and other beautiful architecture. The glorious five storied ‘Nyatapola’ Temple and the ‘Fifty-five window Palace’ are among many attractions here. Bhaktapur is equally famous for its woodcarving, clay works and typical Nepali cap. Bhaktapur today sets an example to its other sister cities as to how one can preserve an ancient city and its outlook for future generation. Bhaktapur is very popular for yoghurt known as Juju Dhou ( “Kings Yoghurt” ). Our guide will explain and show you yoghurt making process in Bhaktapur. After breakfast at Hotel we drive to Changu Narayan Temple, which is considered as one of the oldest Hindu temple in Nepal, after sightseeing we will do gentle walk to telkot where our vehicle will take us to the Hotel in Nagarkot for Night stay. We will observe the beautiful sunset view over the mountains if the weather permits. The Changu Narayan, a Vishnu temple, is situated 18km northeast of Kathmandu city in a ridge. It is probably oldest temple in the entire Kathmandu valley because main temple was built arround 4th centuary AD. It was destroyed, however, several times by fires and earthquakes. The present Pagode was rebuilt in the year 1702. It belongs to old heritage site enlisted by UNESCO. Early Morning sunrise view over the mountain and after breakfast and short rest, Drive back to Kathmandu. Rest and relax at Hotel or explore the Town at own. Enroute Visit Manakamana Temple with cable car ride. Manakamana temple located at a hilltop in a Gorkha district can be visited by 10 minutes cable car ride. 10 minutes cable car ride gives you experience to going up with bird eye view to Trishuli river, Local Forest and Villages. 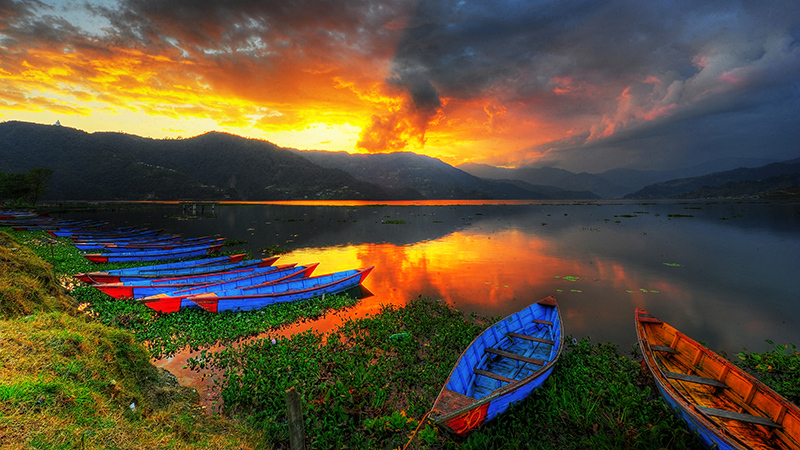 Pokhara,situated 200 km west of Kathmandu, is the most important tourist destination after Kathmandu. This is the entry point for famous Trekking routes to Dhaulagiri, Annapurna and Mustang region. It is a meeting point for nature and culture.Trails for different excursions and hiking are available to suit individual interest and needs. When the weather permits one can enjoy the panoramic view of Annapurna and Dhaulagiri range hardly 25km away from Pokhara. One can enjoy the tranquility and peace while doing boating at Fewa Lake in one hand and see the grand view of the snow clad mountains on the other. The falls are about 2 km southwest of the airport on the road to Butwal, just before the Tashi Ling Tibetan Village. Devi’s Falls marks the point where the Pardi Khola stream vanishes underground. When the stream is at full bore, the sound of the water plunging over the falls is deafening, but the concrete walkways don’t add much to the atmosphere. According to locals, the name is a corruption of David’s Falls, a reference to a Swiss visitor who tumbled into the sinkhole and drowned, taking his girlfriend with him. Late visit to Gupteshower cave next to Davis fall. The roaring Seti River passes right through Pokhara, but you won’t see it unless you go looking. The river has carved a deep, narrow gorge through the middle of town, turning the water milky white in the process. At points, the gorge is less than a metre across and the river gushes by more than 50m below street level. The best place to catch a glimpse of the Seti River is the park near the KI Singh Bridge, just north of old Pokhara on the road to Batulechaur. Walk to Lake side and boatcross to Raniban. Easy walk upto peace stupa ( 1 hours walking to peace stupa steep up). World Peace Pagoda, a massive Buddhist stupa is situated on the top of a hill on the southern shore of Phewa Lake. Besides being a impressive sight in itself, the shrine is a great vantage point which offers the spectacular views of the Annapurna range, Phewa Lake, and the Pokhara city. We Climb the Raniban forest crossing the suspension bridge. After the 2 hours of walk we reach stupa and enjoy the spiritual and scenic beauty. Climbing down from Pagoda is more enjoyable with the view of Phewa Lake and the mountains. We cross the lake after the 20 minutes of boating with the visit to island temple (Barahi temple) in the middle of lake. After cycling, enjoy 01 hour Ayurveda spa at Tranquility spa in pokhara in order to relax your body and mind. Rest Free in Pokhara for plenty of optional Activities.e.g. Paragliding, Bungy jump, Ultra flight, Zipflyer ride etc.. Or explore around the city and Lakeside area at own. After having breakfast we drive to Sarangkot. Visit Sarangkot and walk to nearby village for experience authentic Nepali village lifestyle. Check in at local home where you will be warm welcomed by local villagers with typical nepali style. Enjoy Typical Nepali hospitality with local people. Dinner and overnight at Homestay in Village. O/N in at Homestay in a Village nearby Sarangkot. Enjoy Wonderful sunrise view with breakfast then Drive Sarangkot, Pokhara to Chitwan . After Lunch we drive to Tree plantation nursery organized by WCN Nepal ( World Conservation Nepal), Check varieties of Trees and participate on plantation of Tree then return back to Hotel. Dinner and overnight at Hotel. Chitwan National Park is the first national park in Nepal. It was established in 1973 and granted the status of a World Heritage Site in 1984. It covers an area of 932 km2 (360 sq mi) and is located in the subtropical Inner Terai lowlands of south-central Nepal and house of many endangered plants and Animals. One Horned Rhinoceros, Gharial and many other floras and faunas are the main attraction in National park. Lucky people may also get chance to encounter Royal Bengal tiger in their habitat during safari. Budhanilkantha Temple is a Hindu open air temple dedicated to Lord Vishnu. Budhanilkantha Temple is situated below the Shivapuri Hill at the northern end of the Kathmandu valley . It can be identified by a large reclining statue of Lord Vishnu. The temple’s main statue of Budhanilkantha is considered the largest stone carving in Nepal. Osho Tapoban is an international commune and forest retreat centre. Perched in the lush green Nagarjuna forest, the commune offers various courses on yoga, meditation, psychotherapies and alternate healing as designed by Osho. The commune welcomes many visitors from different countries every year and provides an opportunity for a new way of living – with more awareness, sensitivity, relaxation, celebration and creativity. Evening:- Farewell Dinner with Nepali cultural show with transfers. Your feedback and suggestion to our representative shall be highly appreciated during dinner and conversation.